Curriki Geometry – Imagine a course of study in Math based on Project Based Learning and Geometry. Before visualizing this concept, entertain the idea that this product has no financial constraints. Yes… that means free! The people at Curriki believe that students learn math best by doing it and using it in their lives. This brand new Geometry curriculum can help you and your students in three ways. First, by building the skills and confidence that will help them conquer any mathematical problem. Second, by developing essential 21st century skills such as communication, collaboration, and teamwork. And last, students will love coming to geometry class! Take a look at these engaging Geometry PBL units as described by Curriki! Selling Geometry – This project introduces students to a brief history of geometry, geometric terms, geometric shapes, and transformation and manipulation of shapes through reflections, tessellations, and dilations. Students will form marketing teams to “sell” geometry by explaining key terms, demonstrating key shapes, and describing the significance of geometry to an audience. Designing a Winner Project – This project allows students to apply the geometric principles of triangles, volume, and coordinates to the mapping and design of a multi-purpose arena in a limited area. The arena must serve as a venue that can be easily converted for use by two sports, plus serve as a concert venue if needed. Students will form design teams to create a map showing how the arena can be converted for the two sports. The map will be accompanied by a hand-built model or a digital design using Google SketchUp or other tool. In the final presentations, the map and design ideas will be presented to the local City Council. What’s Your Angle, Pythagoras?Project- One real-world task students must learn is the ability to explain what you know to others. 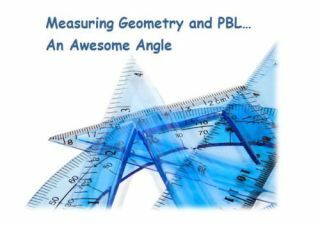 The challenge in this project is for older students to find common examples of right-angle geometry and use their geometric knowledge to create a lesson that explains Pythagorean principles to younger students in a way that is engaging, understandable, meaningful, and relevant. TED Talk: House of the Future Project - The challenge in this project is for students to examine trends in housing, extrapolate that information to predict the future, and use their geometric modeling skills to design a house that supports their predictions. Students will create a floor plan and basic model of a house of the future that reflects four trends and then deliver their design and give evidence of their thinking in the form of a 10 minute presentation about why their house will be necessary and useful in the future. The format for the talk can vary, but it is suggested that the presentation follow the guidelines for a TED-like talk in which presenters give short presentations that focus on the future and innovation. The Art of Triangles Project- This project teaches students the basics of triangles, such as types, congruence, proofs, and similarity, by asking each student to create a poster, drawing, or personal adornment such as a fingernail design, piece of jewelry, or tattoo that uses at least two different triangular shapes. The product must meet the criteria for ‘beautiful’—that is, it must display symmetry or other design elements that make it attractive. As you can see Curriki is delivering a product that brings Geometry to life and provides those important real world connections which is a pillar of PBL. Perhaps your Driving Question should be; “How can I bring one unit of Curriki Geometry to my students?” As you come to an answer, I am sure you will keep inquiring your way back for more. With just a little Curriki Geometry, your students will find themselves, not on the circumference, but in the very center of their Geometric circle of learning. Note… In the next few weeks you will discover an amazing OER Interactive Algebra Resource, explore a Grammar Machine, discover why Santa believes in PBL, and have the opportunity to read a very special letter to teachers direct from the North Pole. Sign up now and please give a retweet!